The Princess Esme Swarovski earrings feature stylized double clover flowers with white pearl centre and 3 light-catching dangling crystal drops. 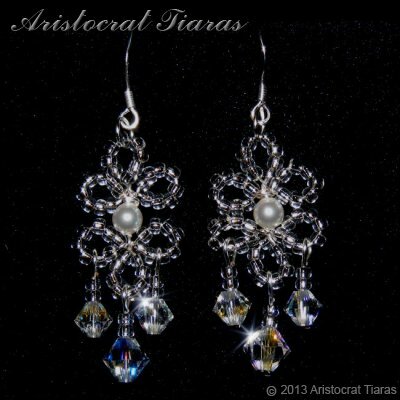 These crystal earrings from Aristocrat Tiaras will give a bride on her wedding day a grand and sophisticated look. Duchess Elizabeth necklace and Lady Caroline tiara are designed to be a perfect match to these earrings. All our bridal jewelry are handmade in Herefordshire UK and suitable for many occasions! Colour and designs may vary slightly from the picture. Ready to ship! These earings could be with you by 1pm Saturday 20th April (tomorrow).